Hello and welcome to the 74th installment of the SWD. Turkish artillery continues to target SDF-held localities around Afrin, there were even reports about Turkish warplanes hovering over the area. Clashes have erupted between SDF and Turkish Army around Rajo town northwest of Afrin near Syrian and Turkish border, according to pro-SDF sources 17 Turkish soldiers were killed and three wounded in clashes, take these casualty numbers with a grain of salt since there is no evidence to prove these claimed casualties. SDF completely captured Al-Wahab and Al-Izaa neighborhoods in Tabqa from IS, besides this Radio Station west of Tabqa was also captured. During clashes in the city 20 IS fighters were killed, 10 captured and four vehicles destroyed. SDF released footage showing a captured IS T-55 tank in Tabqa. “Border war” between SDF/YPG and Turkish Army spread to Tall Abyad area, Turkish Army shelled villages of Karasur, Tel Finder, Aluk and Savsak located around Tall Abyad. YPG targeted and damaged with a mortar Turkish radar as well as Turkish “Atilgan” vehicle which is an anti air system. Number of YPG fighters killed in clashes with Turkish Army is allegedly between 9 and 17. Ahrar al-Sharqiya, a Free Syrian Army group operating in northern Aleppo sent a convoy supposedly heading towards Turkish border crossing, convoy’s destination is Tall Abyad which they reportedly intend to capture from SDF/YPG. Turkish Army removed a part of the wall around Al-Darbasiyah village after yesterday’s clashes between YPG/SDF and Turkish Army. The wall was built between Syrian and Turkish by Turkey, the removal of wall around Al-Darbasiyah could possibly indicate future Turkish offensive around it. 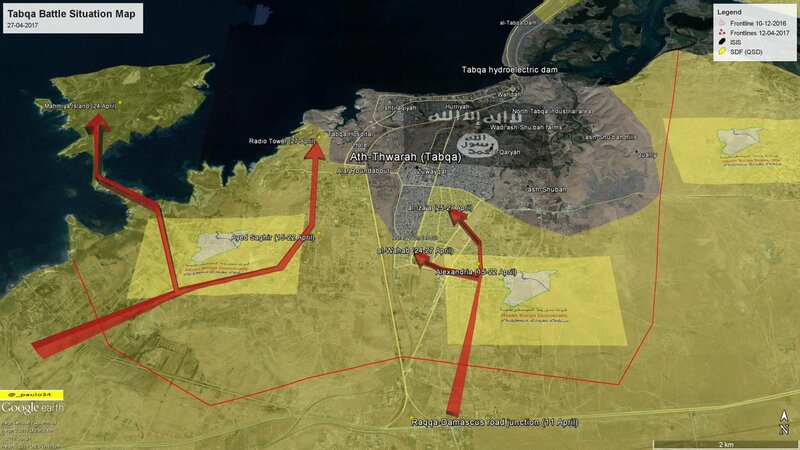 From Turkish viewpoint the offensive would be aimed at securing Turkish border from groups disliked by Turkey. Official statement from Turkish Armed Forces stated that only two soldiers were wounded in yesterday’s clashes against YPG. Rebels launched another attack on SAA-held Masasnah, once again the attack started with an SVBIED targeting SAA positions. After heavy clashes around Masasnah SAA Tiger Forces repelled rebels’ attack. New day, new rebel ATGM hits on SAA targets, four TOW missiles were fired today on SAA positions in Masasnah. Free Syrian Army’s Al-Firqa al-Wusta (Central Division) destroyed a Konkurs launcher while Jaysh al-Nasr targeted BMP and possibly damaged it along with inflicting a couple of casualties on SAA soldiers. Two TOW strikes by Free Idlib Army were on a T-55 tank and a BMP. Free Idlib Army made a very interesting claim today, they reportedly damaged Syrian Arab Air Force’s L-39 Albatros aircraft with anti-air guns. SAA captured an abandoned battalion north of Tiyas Military Airbase (T-4 Airbase) and fully captured Jabal al-Abyad northwest of Palmyra from IS. SAA has also fully secured all Shaer oil wells including the biggest well named “Well 105” located in the northern part of the field, yesterday it was reported that SAA captured Shaer gas field but it appears that only today its area was fully cleared from IS presence. Last night Israel targeted area close to Damascus International Airport with five missiles. Strikes targeted either a warehouse or a fuel tank since the fire erupted after the attack and was visible from far away. According to the Israeli Minister of Intelligence Israel targeted a weapons shipment destined for Hezbollah. New reports by pro-government sources suggest that SAA advance in the southern part of Qaboun pocket reportedly capturing many buildings and a couple of rebel fighters. SAA also reportedly captured main tunnel rebels used to move between parts of Qaboun pocket. Jaysh al-Islam as well reportedly advanced in Barzeh, northern part of Qaboun pocket recapturing several buildings in orchards area and allegedly killing 35 SAA soldiers. In East Ghouta Jaysh al-Islam attacked SAA positions around Hawsh al-Dawahirah reportedly capturing several positions from SAA. Jaysh al-Islam released footage showing rebels targeting SAA‘s T-72 Adra with anti-tank weapon around Hawsh al-Dawahirah, it is unclear if the tank was destroyed or just damaged. Pro-government sources reported rebels’ attack around Hawsh al-Dawahirah was repelled. According to several sources agreement was reached between Syrian Government and Hayaat Tahrir al-Sham regarding latter’s departure from Yarmouk Camp, Damascus to Idlib. Agreement has not been implemented yet and it includes Hayaat Tahrir al-Sham handing over the small part of Yarmouk district they control to SAA, most of the Yarmouk district was captured by IS from Hayaat Tahrir al-Sham. However, this deal may not go as planned and there might not be any HTS fighters to evacuate because IS has attacked HTS-held part of the district and made advances according to Amaq Agency’s report. Israel targeted a drone belonging to SAA & allies with a MIM-104 Patriot surface to air missile system after the drone entered Israeli-controlled Syrian Golan Heights. Drone was monitoring rebels’ defenses in Quneitra governorate and accidentally wandered off into Golan. It is still unknown if the drone was destroyed or not. IS opportunistically attempted to attack Al-Hashd al-Shaabi’s positions southwest of Tal Afar now that major part of the troops is engaged in an operation southwest of Mosul in Al-Hadhar region. The remaining Al-Hashd al-Shaabi’s fighters were able to fend off the attack after clashes that lasted several hours. IS reportedly suffered heavy loses in this attack as around 80 fighters were killed and 17 SVBIEDs destroyed. Al-Hashd al-Shaabi have captured Al-Hadhar village from IS, the main target of Muhammad Rasul al-Allah (Prophet Muhammad) operation which might have more phases in the future and this is just the end of the first one. 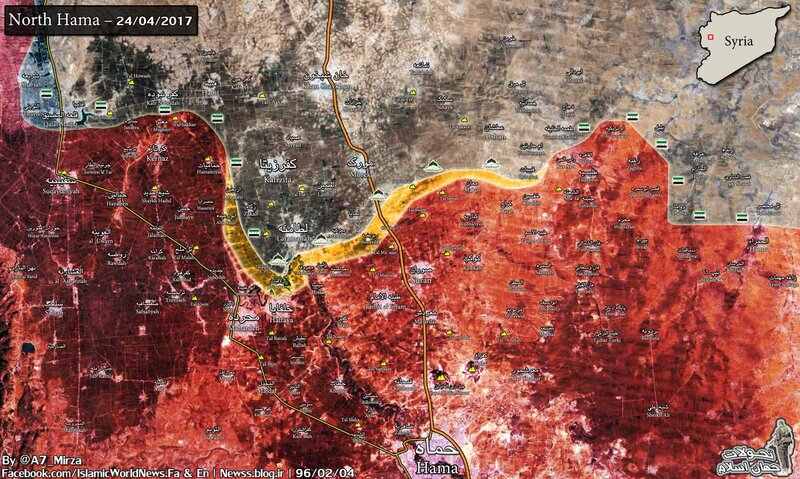 The capture of Al-Hadhar doesn’t come as a surprise since it was encircled after yesterday’s advances and stormed. Besides Al-Hadhar other localities captured from IS today include Um al-Ajareej, “Ancient Ruma Site” and Tareeta. According to Iraq Joint Operations more than 150 IS fighters were killed today in Al-Hadhar region and 30 houses cleared from improvised explosive devices planted by IS, additionally 20 IS SVBIEDs were destroyed during today’s clashes. IS SVBIED attempted to target an Iraqi Army’s checkpoint on a road between Baghdad and Khalis northeast of Baghdad. SVBIED was destroyed by Army before it reached desired destination. On the 26th of April 2017 CJTF-OIR has conducted 14 strikes in Syria. CJTF-OIR‘s main focus in Syria at the moment is Tabqa-Raqqa-Deir al-Zour region where they did 13 strikes supporting SDF‘s operation against IS destroying eight IS wellheads, five oil processing equipment items, two IS barges, six fighting positions and a fuel truck. Other area where one strike occurred is Abu Kamal engaging an IS tactical unit. Full report on CJTF-OIR strikes conducted in both Syria & Iraq can be found here.